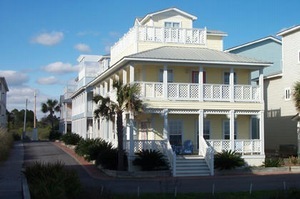 Check out our specials for your Holiday Shopping, Christmas Vacation, New Years Vacation, or just a winter break. 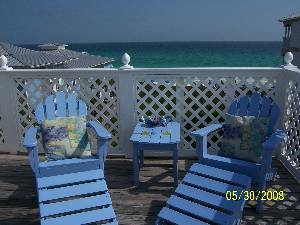 This wonderful 3 story beach home has all the charm you need to relax and enjoy the pristine beaches of Seagrove and the quaint atmosphere of Scenic 30A. Located in Majestica (a beachside village), it has a newly finished community pool. It's only 30 feet from the front porch to the beach walkover. Every floor has a large porch with seating for afternoon cocktails, morning coffee, or just reading / viewing / family time. Views from the top deck are unobstructed, as there is only a vacant natural landscaped lot between Sundancer and the beach. 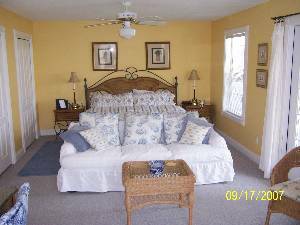 Second floor: Large bedroom with King bed, sitting area, private balcony with Adirondacks, 2nd phone line for use with laptop or extra phone, TV and VCR. Private bath has a Jacuzzi tub, separate shower, and double sinks. (sleeps 2). 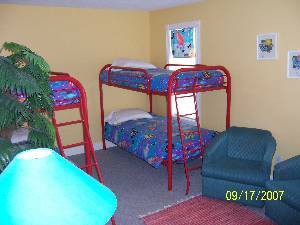 Bunk Room with two sets of twin bunks (sleeps 4). It has a TV and a VCR. Shared bath is directly across the hall. Bedroom with Queen bed, private balcony, TV, and shared bath just outside door. (sleeps 2). 3rd floor - Tower room has fantastic views of the Gulf. 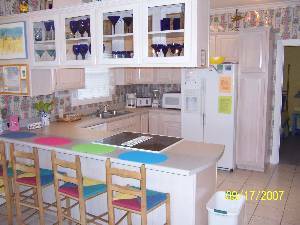 It has a large deck for entertaining, reading, relaxing, sunning, or family time. The tower room has a half bath and a sleeper sofa. (Sleeps 2). Altogether, Sundancer can sleep 14 and has 3 1/2 baths. Amenities: Amenities include complementary beach service (March to October)which includes 3 umbrellas and 6 chairs, Parking in private parking pad for four vehicles (extras can be parked at nearby rental office), Free video rentals, CD Player, Washer, Dryer, cable TV, Outdoor shower, Answering machine, Bar-B-Que Grill, Tower with wet bar/small refrigerator. 2nd line in master suite for use of laptop or long calls without tying up primary line. Located in Majestica, which is a family oriented community. There are only 6 rental homes in the group. If you need more room than Sundancer can offer, please consider renting two or more homes and have a real family reunion. Please inquire for more information. Activities: Swimming, kyacking, bike path for biking, bicycle rentals and motor scooter rentals within 1/2 mile, sailing, golfing, fishing, amusement parks, shopping, fine dining, gulfarium, dog track. Area: Located in one of the hottest vacation spots in the Florida panhandle. Seagrove is nestled between the resorts of Seaside and Rosemary Beach, providing access to great restaurants, shopping and activities. 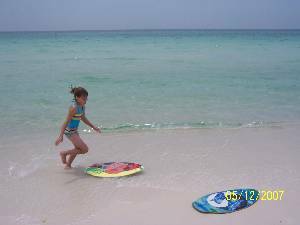 Two of the beaches in this area, Panama City Beach and Destin, were rated Top 10 beaches by USA Today magazine. Seagrove Beach is just as beautiful, if not more so. 30A, also known as the scenic corridor, is an area that makes you want to come back again and again, because of all the spectacular restaurants and shops, but without the traffic and congestion of other beaches. Sorry, No Pets. No Smoking in home. 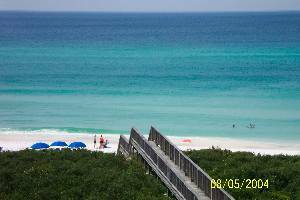 * No shark attacks have been reported in Seagrove beach in over 100 years. This is as reported by the Shark attack center in Tallahassee. According to locals, this is attributed to limited commercial fishing in area, and no river outlets in area. There's always a first time for everything, but knowing the statistics and the precautions you should take are a must. Please visit the International Shark Attack file, run by the University of Florida at the link located in the Rental Details section of this listing. It gives statistics, relative risks, preventative measures and is very informative. Free beach service (3 umbrellas, 6 chairs) set up each day for you in season (Mar to Oct); free video rentals. Bike path runs through entrance to property. Located on 30-A. Bike, canoe, and kyack rentals within 1/2 mile of beach house. Tax and fee not included in rates. E mail to request last minute specials for unoccupied dates. Cancellations and Refunds: 60 day required. Required Stay: Saturday to Saturday weekly.